“He was sitting right outside the main door, and his tail started thumping when he saw me." 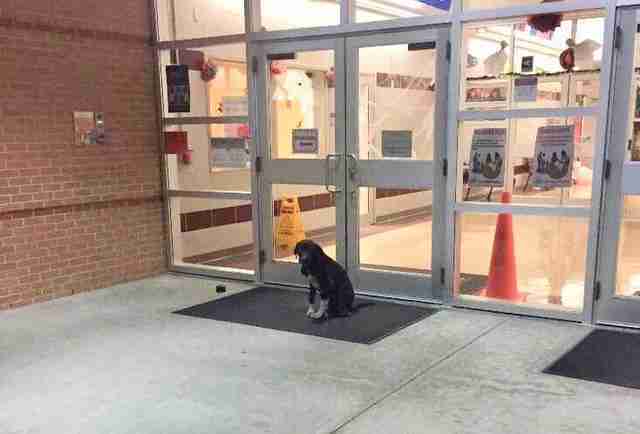 When Houston, Texas, elementary school teacher Caleb Schaffer arrived to work one morning last month, he didn’t see kids waiting to get in; instead, he saw a dog. “He was sitting right outside the main door, and his tail started thumping when he saw me,” Schaffer told The Dodo. Schaffer had to get to work, so he squeezed past the Lab mix and went inside. But he was so haunted by the scared and sick-looking pooch, he went back outside later to check on him. Unfortunately, the dog was gone. Schaffer heard that someone had called animal control, but the officers could not catch the dog. But when Schaffer got to work the next morning, the dog was there again, waiting in front of the school doors. He seemed to instantly recognize Schaffer. Feeling heartbroken, Schaffer went inside to teach. He thought the dog was reaching out for help, and told his students he needed their help keeping an eye out for him. As soon as the school bell rang at the end of the day, Schaffer went out to look for the dog, but couldn’t find him. But when Schaffer got to work the next day, guess who was waiting for him? Schaffer didn’t have much time before school started. He quickly drove the dog back to his apartment and his wife watched him while Schaffer zipped back to work. Schaffer then took the afternoon off so he could go home and help the dog. However, Schaffer couldn’t keep him — his complex allows each apartment two dogs, and he was already maxed out with his own pooches. Schaffer called dozens of rescue groups asking if they could take the dog, whom he decided to call Clive, but none had room. 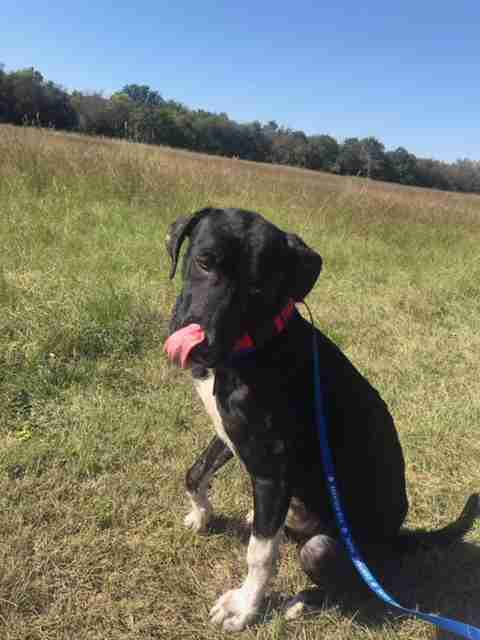 Since Clive needed immediate care, Schaffer brought him to the animal shelter in Harris County. 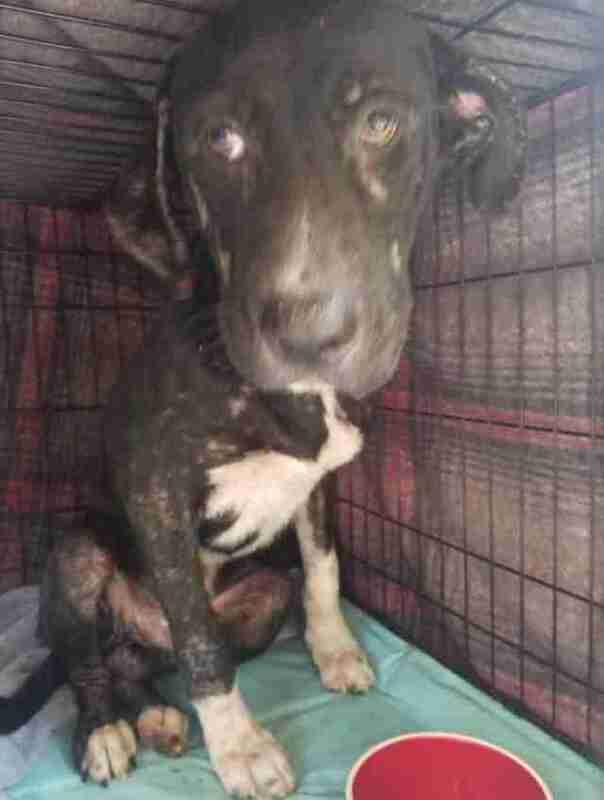 “I figured some basic vet care at the shelter was better than nothing. He was really suffering,” Schaffer said. Once there, Schaffer gave Clive a medicated bath. Schaffer then went to work networking Clive. He sent pictures and video he took to the Urgent Shelter Pets of Houston Facebook page, which posted about the dog. 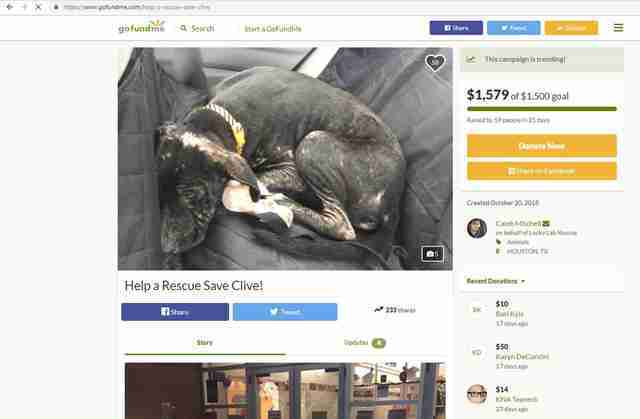 Schaffer set up a GoFundMe page to help pay for Clive’s medical expenses. Meanwhile, the clock was ticking on Clive’s life at the shelter. 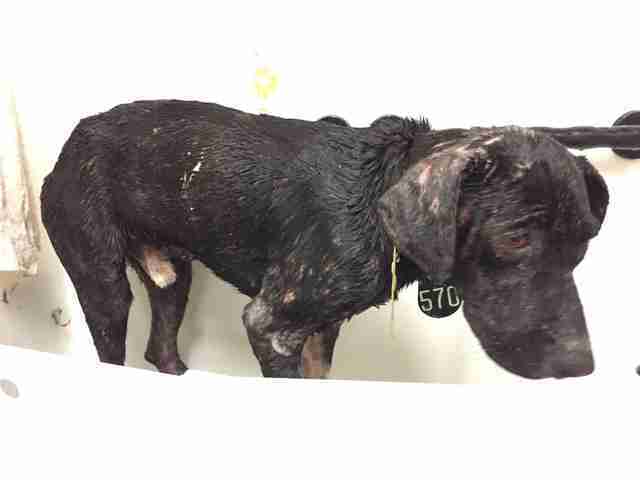 Schaffer worried if no one saved him soon, he would be euthanized. Finally, Schaffer got some good news. 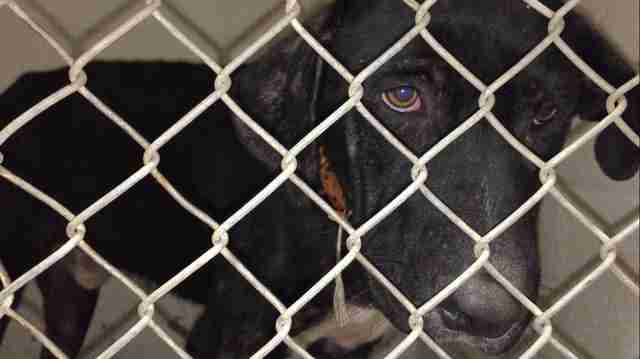 Volunteers with Lucky Lab Rescue and Adoption saw the video about Clive and wanted to save him. “I was overcome with joy,” Schaffer said. 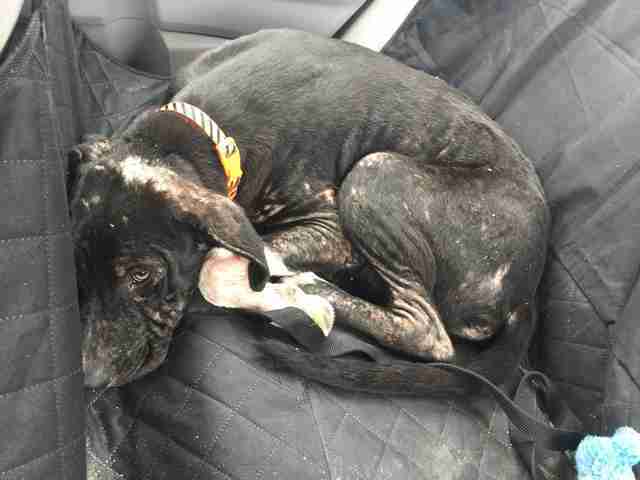 A couple in Austin, Texas, offered to foster him, and the rescue arranged Clive’s freedom ride from the shelter. And when Clive first met his foster parents, it was obvious he could not wait to be part of a family. After some love and vet care, Clive is now healing up and looking great. Clive will always remain in Schaffer’s heart. He tells Clive’s story to his students to teach them why it’s important to care for dogs properly. 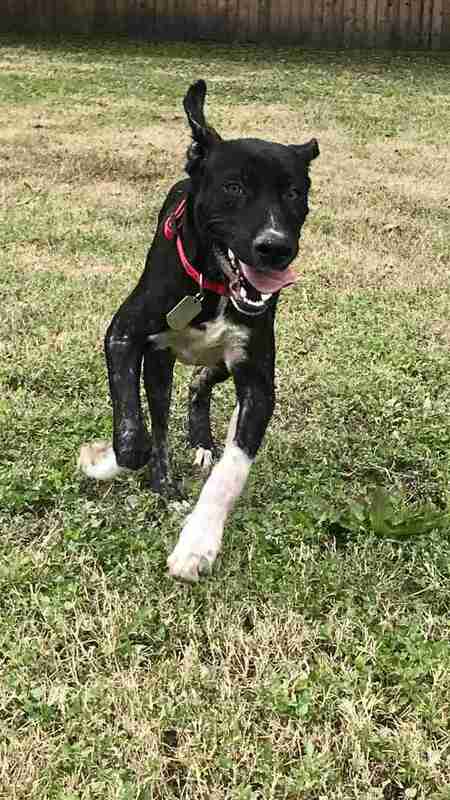 If you’re in Texas and interested in adopting Clive or donating to his care, visit Lucky Lab Rescue and Adoption’s website.